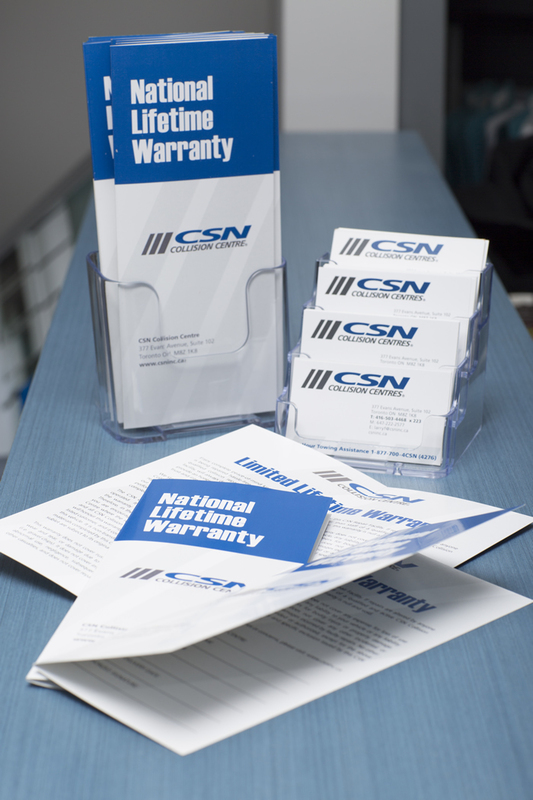 CSN’s National Lifetime Warranty lets you travel with ease! Enjoy complete peace-of-mind knowing that your vehicle is being repaired hassle-free. We stand behind our quality and workmanship and every CSN collision repair shop offers this warranty on all repairs performed – for as long as you own your vehicle. We guarantee that our collision repairs to your car or truck meet or exceed industry standards at any of our auto body and paint shops across the country. CSN is Canada’s largest network of auto body repair and collision repair shops in Canada. Not all collision car repair warranties are the same. Some auto body repair shops limit the amount of car repair warranty coverage they offer. CSN stands behind our quality and workmanship so strongly, that each of our shops offers a National Lifetime Warranty on all car repairs performed, for as long as you own your car. This way, having your car or truck repaired at any one of our auto body shops across the country guarantees you complete satisfaction. Should you ever need warranty work performed, you are encouraged to visit the original CSN Collision Centre in which the repairs were completed. However, any and all CSN Collision Centres across the country will honour this National Lifetime Warranty for your vehicle repairs.